This is my entry for DZ Doodles Challenge #5. The theme is to use 'a sketch from another challenge. I have used an old sketch from IACCB (sketch #8 2009). 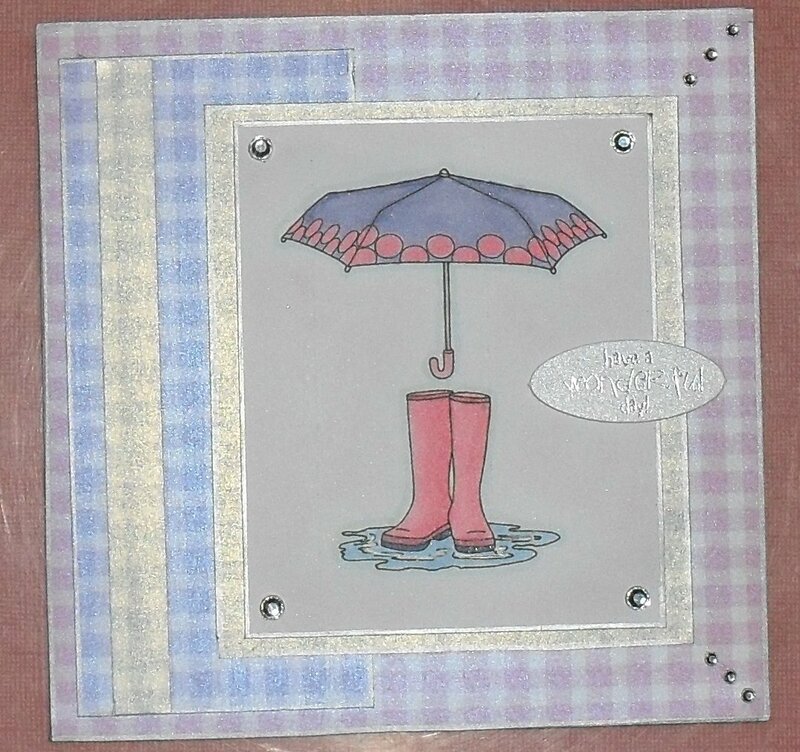 The backing papers are from CC's Mrs Tiggywinkle CD and the image is a DZ doodle freebie coloured with copic markers. The sentiment is from Craftwork cards and the gems are from my stash. Hiya Poppet. This is so delicate and very beautiful. such a lovely image and great design. the papers are perfect for this. Happy crafting. A beautifully "easy on the eye" card Poppet. The soft colours are refreshing and cool! A lovely card Poppet, love the colours on this! How precious is this? Love the colors and the layout is really cut. This is a very pretty card! I love the colors of your papers, your image and layout! Perfect for a Spring card! nice card good luck whit it . Sweet card!!! Love the colors! That umbrella and rubber boots wouldn't be any good here today,we got more snow!!!! Urghhhhh!!! When will we get spring??? Have a wonderful day Poppet!!! I love it,you really made a beautiful card with this image. Thanks for joining DZDoodles Cahllenge. 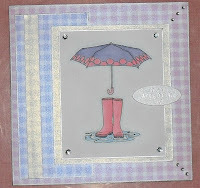 A fabulous card Poppet, I love the rainy day image and the colours are fab!